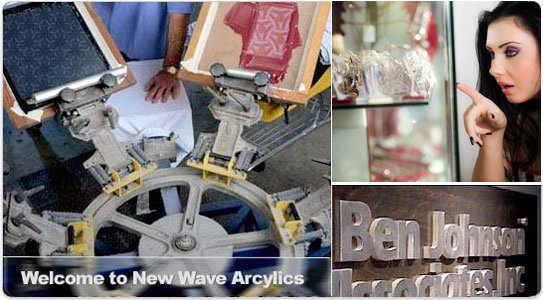 New Wave Acrylics work with both small and large companies to design, develop and produce custom plastic products including acrylic display cases, acrylic letters, acrylic awards, acrylic signs, display stands, brochure holders, dimensional letters, acrylic podiums and more from start to finish. Most of our clients come to us with just an idea in their heads or a rough sketch. From there, we develop a prototype for their approval. Once all the necessary modifications have been made, the prototype moves to production. At this point, we produce anywhere from 10 to 10,000 units, with most orders averaging 50 to 500 units. © New Wave Acrylics. All rights reserved.